When it comes to a movie like Batman V Superman: Dawn of Justice, it can be difficult to keep track of who's who in the cast, given just how many cast members there are. Add to that some of the cast members whose roles are shrouded in mystery, in order to avoid spoilers, and things become even more confusing. One of those mysteries has been who Halt and Catch Fire's Scoot McNairy will be playing. Will he be Jimmy Olsen, The Flash, or perhaps a key to the origin of Cyborg? Theories have abounded, but most have involved characters who are already well known. Now, a new rumor suggests that the actor may be playing a character who is more of an unknown, although not unimportant. According to Latino Review, the green leggings McNairy was seen wearing on the set of the movie were not to blur his legs out for an appearance as The Flash, but to remove them entirely due to an injury his character suffered during the events of Man of Steel. 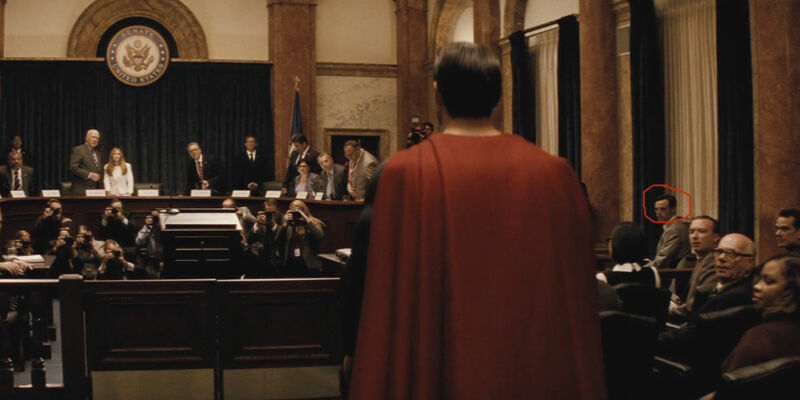 As a result of his injury, McNairy's character is brought into the Senate to testify against Superman. However, the trouble he causes Superman does not end there. "McNairy's wheelchair-bound character will be brought in to testify against Superman to the U.S. Senate, but also becomes a victim of Lex Luthor's campaign against the Man of Steel. One of Luthor's schemes in the movie involves turning McNairy's character into a human bomb of sorts, radicalizing him, in an attempt to get him close to Superman and to hurt him." It's not clear whether they mean a "human bomb" in a figurative or a literal sense. Will his presence blow up in Superman's face, or will he literally blow up in Superman's face? Either way, those scenarios make it pretty unlikely that he's playing a legless version of Jimmy Olsen, and even more unlikely that he's playing a version of The Flash. The theory about his somehow tying into the origin of Cyborg could still hold, but he will definitely not be playing Cyborg himself, as that role has already gone to stage actor Ray Fisher. The scenario offered by Latino Review is, of course, just a rumor at this stage. The website has a mixed record of success with their rumors regarding superhero movies, but this one rates pretty high on the plausibility scale, given what we already know from set photos and trailers. While the name Scoot McNairy certainly sounds like the alter ego of a DC universe superhero, it seems like his character may just end up being someone who pays the price for being in the wrong place at the wrong time.